Kuala Lumpur has evolved into a 21st century metropolis dominated by the tallest skyscrapers in south east Asia. Historic temples and mosques rub shoulders with space-age towers and shopping malls while locals sip cappuccino in coffee shops or feast at bustling streetside hawker stalls. 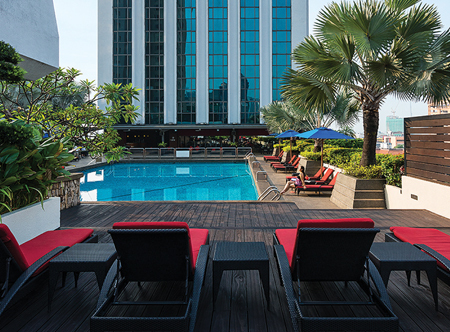 KL, as it is affectionately known, is a city that is truly one-of-a-kind. Kuala Lumpur is a compact city and most of the tourist sights are easily explored on foot, however the city has an excellent network of public transport including buses, metro (Light Rail Transit) and a monorail making it easy to get around. Taxis are also available, but as the roads can be busy, they may prove be a more expensive option. At the historic heart of the city is Merdeka Square (or Independence Square). Ringed by handsome colonial-era buildings the square marks the place where the Malaysian flag was hoisted for the first time following independence from British rule in 1957. On the west side of the square is the Royal Selangor Club, while on the eastern edge is the distinguished Sultan Abdul Samad Building. 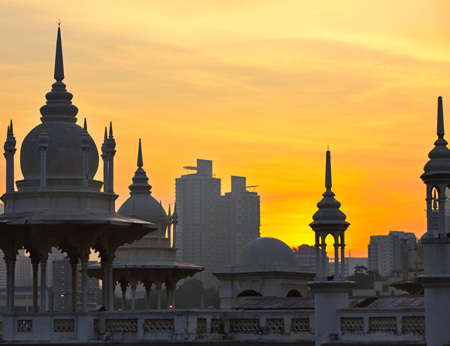 Other nearby notable historical buildings include the highly acclaimed Jamek Mosque, which is a vision of soaring minarets and onion-shaped domes; and the imposing Old Railway Station. 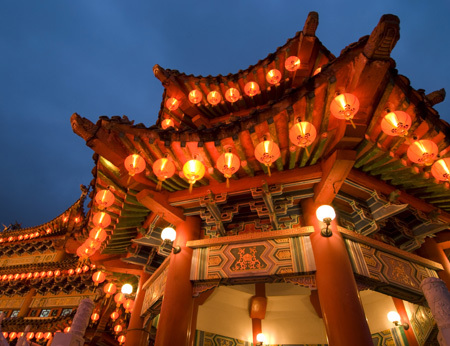 To the west of the colonial area is the popular Lake Gardens, a green oasis with boating lakes, pavilions, an orchid garden, deer park, butterfly park, bird park and planetarium. Modern Kuala Lumpur City Centre (KLCC) sits in the financial district of KL, known as the Golden Triangle, and is where you'll find many of the city's luxury hotels along with the 88-storey Petronas Twin Towers, which are the epitome of contemporary KL. If you have a head for heights don't miss the panoramic views from the sky bridge linking the two towers at the 41st and 42nd floors. Other sights within this district include the verdant KLCC Park and the Aquaria KLCC, which is home to over 20,000 aquatic and land mammals from all over the world. For city skyline views that include the Petronas Twin Towers head to the observation deck of the Menara KL Tower, which is higher than the Petronas' skybridge, or perhaps take tea at the revolving Seri Angkasa restaurant one floor higher. To the north of Kuala Lumpur in Selangor are the Batu Caves, a series of giant limestone caves which were discovered in the 19th century and are among the holiest Hindu shrines in Malaysia. The entrance is dominated by a colossal statue of the Hindu deity Lord Murugan and a flight of 272 steps lead to the main cave, Temple Cave, which is where most of the shrines are located. Kuala Lumpur is also a great destination for shopping. If it's high end fashion you seek, the Bukit Bintang and KLCC areas provide excellent choices, with upmarket malls such as Suria KLCC and Pavilion KL. Alternatively, Berjaya Times Square, one of the largest shopping malls in the world, has over 1,000 retail outlets, an indoor theme park, cinemas, food outlets and a bowling alley. For a real sense of the city's local shopping scene, take a stroll around one of the bustling markets, such as the huge Central Market on Jalan Benteng or the vibrant night market along Petaling Street in Chinatown for the chance to haggle for clothing, accessories, handicrafts, souvenirs and much more. Food is without a doubt a highlight of any visit to KL, with so many opportunities to enjoy a diverse assortment of local and international cuisine. Expect everything from award-winning gourmet restaurants with menus from around the world, to chic bistros and traditional street stalls that line the city streets and offer an excellent choice of inexpensive dishes. 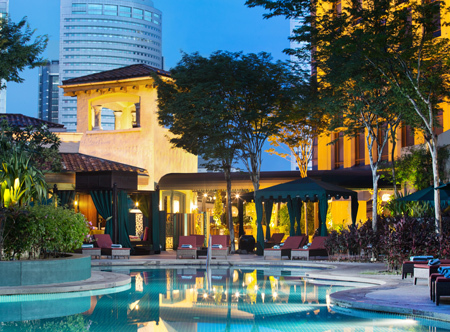 Kuala Lumpur is a lively nocturnal hub of cafes, pubs and clubs where you can dance the night away, as well as glitzy rooftop cocktail bars within five-star hotels, so it's safe to say that there's no shortage of exciting places to spend the evening in Kuala Lumpur. 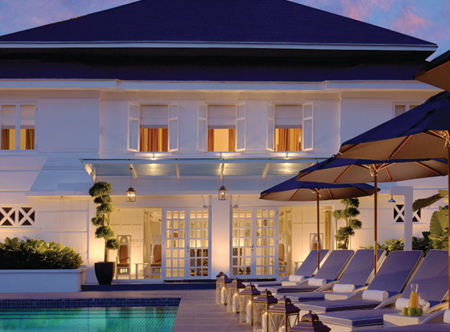 Call and speak to one of our travel experts who have experienced Kuala Lumpur personally. 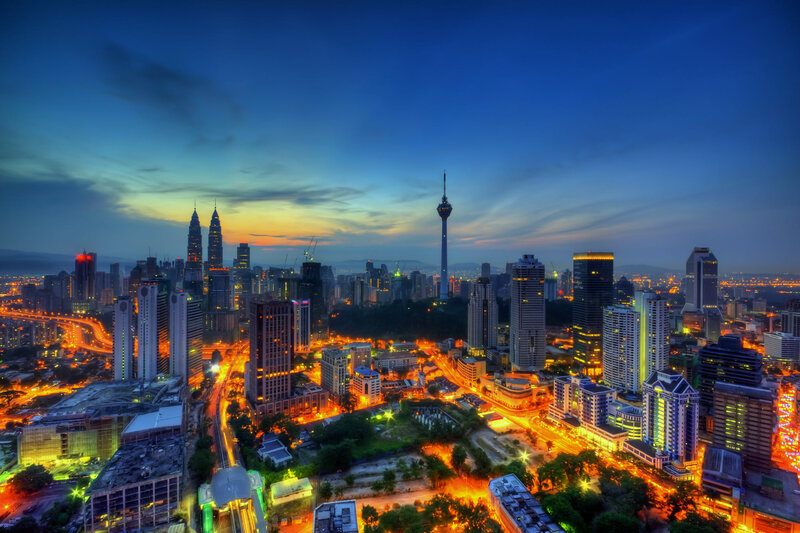 Kuala Lumpur is approximately 13 hours (non-stop flights) from the UK. 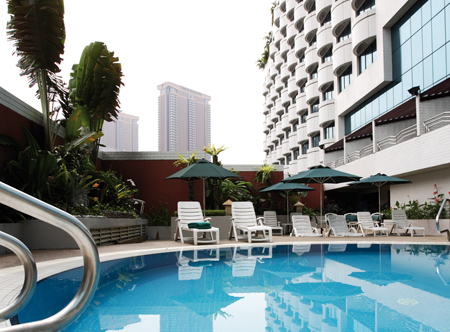 Kuala Lumpur has a tropical climate with consistently high temperatures in the 30ºs, making it a year-round destination. The wettest weather is usually February to May and September to December when sudden thunderstorms or downpours may occur.